The Federal Communications Commission yesterday released broadband speed test data for the first time in two years, after ignoring months of inquiries about why the annual speed test reports hadn't been released since Ajit Pai became chairman. As we reported last month, the FCC's Measuring Broadband Program hadn't issued a new report since December 1, 2016. Pai's office ignored questions from Ars about the lack of new data, and his commission never provided documents in response to a public records request we made in August. 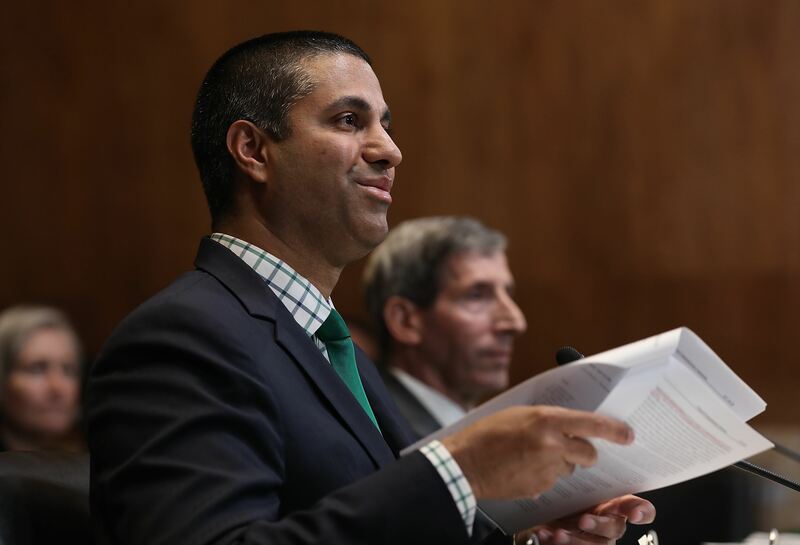 But now, the FCC has released a draft of two Measuring Broadband America reports, one for 2017 and one for 2018. Instead of releasing each annual report individually once per year as the Obama administration did, Pai stuck the 2017 and 2018 reports into the final appendices of a new "Communications Marketplace Report" that essentially consolidates a bunch of reports that were formerly released individually. You can find the 2017 Measuring Broadband America report in Appendix F-1 on page 349 and the 2018 report in Appendix F-2 on page 463. The 2017 report is written as if it was drafted in 2017, and Pai's FCC has not explained why it wasn't released last year. The 2017 report is based on data collected in September 2016, while the 2018 report is based on data from September 2017. "We're all frustrated when our broadband speed doesn't live up to what was promised," FCC Commissioner Jessica Rosenworcel, the FCC's only Democrat, said in a statement to Ars today. "So it's downright unacceptable that the FCC—which has been collecting data on broadband speeds nationwide—is slow to make this information public and, when it does so, buries it in the appendices to a larger report. This is essential data for every consumer in the digital age. The public deserves better." The draft Communications Marketplace Report is 181 pages, while the appendices are 581 pages, for a total of 762. Pai explained the decision to combine many reports into one in a blog post, writing that releasing reports separately "mak[es] it hard for elected officials and the public to track everything down." "For the first time, the Report places essential information about mobile wireless, video, audio, wireline broadband, voice telephony, satellite, broadband deployment, and international broadband all in one place," Pai wrote. Measuring Broadband America relies on equipment that measures actual broadband speeds in thousands of US homes, although it appears the sample size is getting smaller. The FCC started the program in 2011 with about 6,800 testers, and last month the FCC's testing firm (SamKnows) told Ars that its equipment is still collecting data for the project in 6,000 to 10,000 homes. Despite that, the reports released yesterday were based on data from only about 4,500 homes. The 2017 and 2018 reports show that the median speeds provided by cable and fiber networks are still generally at least 100 percent of their advertised speeds. But DSL networks operated by AT&T, Verizon, CenturyLink, Frontier, Windstream, and others still aren't providing the "up to" speeds they promise to consumers. Satellite provider ViaSat also fell short of providing its promised download speeds. DSL shortcomings aren't a surprise, as speeds over copper degrade with distance, so homes farther from a DSL provider's plant get lower speeds. DSL ISPs can boost speeds by laying fiber deeper into their networks, reducing the distance that data must travel over the old copper telephone lines. But the providers' continued poor performance indicates that they haven't added enough fiber to their networks to eliminate the discrepancy between advertised and actual speeds. The FCC's 2018 report makes it harder to gauge whether some DSL networks are providing their promised speeds. In the 2017 report and earlier reports, the rankings had two scores for AT&T: one for its DSL network and another for its more advanced IP broadband network. You can see the two AT&T rankings in the charts above. AT&T fiber-to-the-home service was not measured; AT&T's IP broadband, essentially a faster version of its DSL, only goes up to advertised speeds of 45Mbps down and 6Mbps up. The 2018 report still lists Verizon DSL and Verizon fiber separately but presents the Verizon DSL data differently than in previous reports, again making it more difficult to make year-over-year comparisons. This can also be seen in the above charts. Instead of advertising "up-to" rates like other DSL providers, Verizon "advertises a speed range for DSL performance and has requested that we include this range in relevant charts; we indicate this speed range by shading on all bar charts describing Verizon DSL performance," the new FCC reports said. The charts appear to show that Verizon exceeded its minimum speeds but didn't provide the maximum speeds it promised. We've asked SamKnows questions about changes in the report and will update this story if we get answers. 2:26 PM 04/05/2019 | World Matt M. Miller | Contributor Child brides from Nigeria are being adver.. Wired UK/Shuttershock Thousands of hacked websites have become unwitting participants in an advanced..